Our latest release simplifies the filing and payment process, as well as creation of withholding tax reports for individual branch codes. Before, whenever you file and pay taxes through JuanTax, you need to undergo three steps namely: Step 1: Filing Type, Step 2: Payment and Step 3: Send DAT File. Now, we’re simplifying the tax workflow by reducing the steps into two: (1) Filing Type and (2) Payment. How ‘bout sending of .DAT Files? The sending of .DAT files can now be done during Step 1 of your filing process. The process would still be the same once you hit Save after choosing Manual Filing. You’ll be prompted to a modal where you should confirm that you want to file the report, The only difference is that there will be 3 buttons present namely: (1) Save, (2) Send MAP and (3) DOWNLOAD MAP. Once you click Save, it will go to the normal manual filing process, where it will be marked as Filed, and you would be able to view and print the tax form and submit a printed copy to your RDO. Clicking this button will allow you to send your file through email. Enter the email address of the person that you also want to have a copy of the confirmation before you click Send. This button will allow you to obtain a copy of the actual .DAT file in your device. While for eBIR filing, there are two options to choose from: (1) Send and (2) Download MAP. 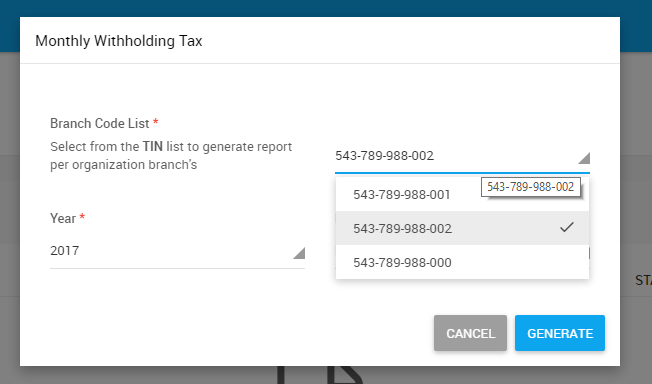 You can now also create withholding tax reports for individual branch codes in your Xero integrated JuanTax account. Visit this link to learn more about this new feature in JuanTax.